Training the mind to go beyond what seems possible separates Louis from the average bodybuilder. A trait passed down from his father guides him to glory! I've always been an athletic person and competed in every sport. In high school, I played basketball and track; two sports that require speed, agility, and quickness. I never needed any power nor did I have any desire to lift heavy weight or diet. When college started in 2008, I wasn't exactly a shoe-in. I didn't enjoy the party scene nor did I want to be in clubs or anything of the sort. My focus was on work and school. As the year went on, my roommates and I didn't get along. In December 2008, I started going to the school gym. It was a massive building with basketball courts, pools, an indoor track, and a huge weight room with every machine known to man. It started off playing basketball until I noticed how small I was; a mere 150 pounds as a freshman. I started lifting, but nothing big because I didn't know how to exercise or how to schedule my lifts the right way. That was until I went home from college and told my father what I did in my spare time. My dad pulled out his old bodybuilding photos and started explaining everything he went through to get to that point. That was the kickoff for me. It motivated and drove me to start working. Although I didn't start a diet, I started lifting with my dad as much as possible so I could learn how to create an exercise regimen. As college continued, I didn't diet much because I was poor with no knowledge about supplements, but I continued to lift every day. During the next four years, I progressively became more knowledgeable and started learning different moves from friends who knew different movements due to their experiences. Those guys are Nick Jones, who aspires to be a pharmacist, Michael Sandidge, who is in ETSU's nursing program, and Jeremy Hood, who is a personal trainer. They gave me the three aspects I needed to peruse my passion. I'm a big believer in constant change. This is the workout that made me sore every day, especially on leg day. You will notice that four days of the week I do abs because I believe abs need rest too. I also add in three days of light cardio to keep my metabolism up. You will notice I do back twice per week because it's my week point. My day of full body movements isn't an easy day and I work forearms and calves hard. I use a carb-cycle strategy when bulking. I have a cheat meal once per week. During my bulking phase, I'm a straight carnivore and eat every source of protein to keep my body guessing. I also drink 1-2 gallons of water per day. During this phase, my only carb sources are sweet potatoes and rice cakes. I focus those carbs on pre and post-workout meals so they are used while my metabolism is still up. I continue eating cheat meals once per week until four weeks out from a show. Tilapia and eggs are similar in their amino acid makeup (they're fast-releasing proteins), which is why they're more dominant in my cutting phase. What/Who Motivated You to Be a Bodybuilder? Motivation is easy to come by when people say you can't do something. I'm sitting here telling them I did it. My motivation comes from negative people who are jealous. I want to work and train harder than most people to prove my dedication and willpower. When I feel like turning back, I think about how I feel when I don't lift. I also listen to the compliments I get from friends and family. They are a big inspiration when I can't see what they see. I also look at people like Ronnie Coleman and Jay Cutler who never quit. I look back at my contest videos and see how happy I was with the results I received. My inspiration is seeing and living this lifestyle to the fullest without regret. I'm working in a health shop currently, which is the next best occupation to professional bodybuilding, in my opinion. I'm going through a bulking phase, which I believe is the hardest part of bodybuilding. Getting through the mental block to lose abs and gain weight is tough. I plan to compete in May and August 2013, but until then, this is a lifelong process. Right now, someone out there is getting bigger. Make that person you. My favorite bodybuilder is my father. Seeing his physique then and now is amazing. He still loves lifting. For some people, it's a phase. For him, it's a lifelong process that was passed down to me. Bodybuilding.com is always there when I need supplements or have a question about ingredients. 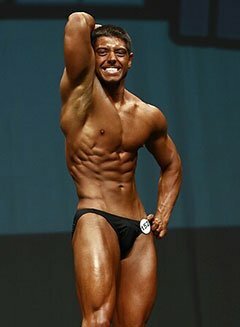 Bodybuilding.com also helped me buy pro tan for my first contest. The customer care specialist recommended products and they all worked perfect. I love Bodybuilding.com.